As the sole guest on Wednesday's "The Tonight Show" special, Michelle Obama made her last appearance as first lady on the show and shared her preparations for life after eight years in the White House in an emotional farewell to the nation. Upon Obama's entrance on the "Tonight Show" set, Fallon said he felt emotional during President Obama's farewell address on Monday. "I lost it at home," Fallon said. "Malia was crying. Sasha she wasn't there." Obama explained that her youngest daughter, Sasha Obama, stayed at home to complete a school exam during her father's final speech. "You know the Obamas, 'Girl sorry," the first lady said while laughing. "You better take your test. ... You can say goodbye later.'" Fallon displayed White House memories to the audience, showing Obama some of the most popular moments of the first family during President Obama's administration. "It is nuts, I feel like crying right now and I didn't think it was going to be that emotional," Obama said to Fallon. "It has been super emotional for all of us in ways that we didn't expect." As Fallon flipped through some of the Obama's most well-known photos, Obama quipped humorous remarks about her husband's light-hearted captures. "The most iconic ear profile shot in the land," Obama told Fallon after looking at a still of President Obama standing alongside and the Easter Bunny. 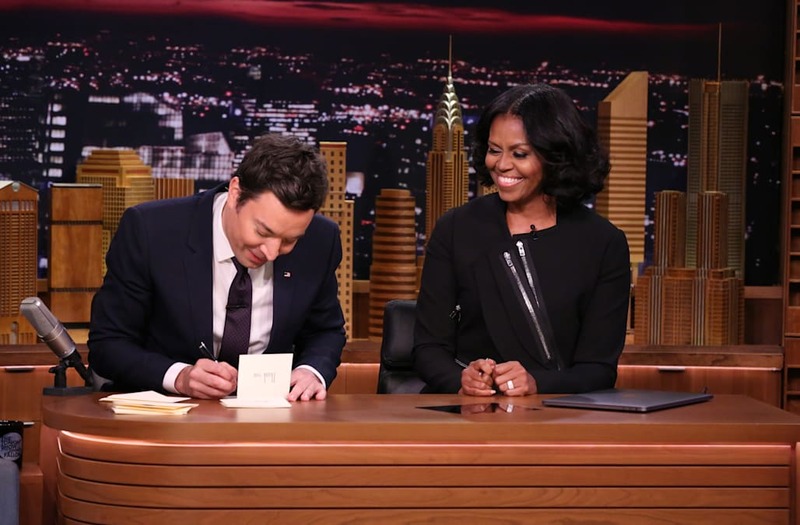 Obama and Fallon also did the show's popular "Thank You Notes" segments. Fallon penned a note to Michelle thanking her for being a "strong, smart, independent woman — an activist, a style icon and a great dancer," and for showing the world what it would look like if "Beyoncé married a much nerdier Jay Z." Obama also wrote a thank-you note to her husband, "Thank you Barack, for proving you're not a lame duck, but my very own silver fox." For his last note, Fallon praised Michelle for her health initiatives and quipped, "Since you like running so much, how about running for president?" To which Obama answered to that she has no desire to seek elected office. Obama went on to say that she and her husband will instead be working to help make the Trump family and administration transition into the White House as smooth as possible. "Democracy is not about party," Obama said. "We're all trying to get stuff done, and we've seen that decency and were trying to emulate that decency, so were going to be supportive to the Trump administration as much as we can."